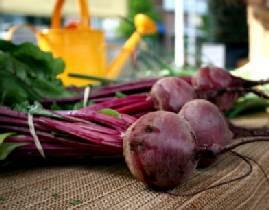 Beets are a main ingredient in many natural food colorings. Food coloring adds brightness and interest to food. However, commercial colorings are made from dangerous chemicals that can cause harm to the body. If you want to enhance your food but are not interested in the toxic side-effects, consider using natural food coloring. Natural food colorings are becoming more popular and can be purchased from a wide number of distributors, or made at home with common spices and vegetables. With an increased interest in health and wellness, there are numerous places to find all natural food colorings. Options for colors are plentiful, and many of these online sources make colorings that are beneficial to healing and restoration of cells within the body. Wild offers safe and natural food and beverage colors made from quality organic materials. They are a member of the International Association of Color Manufacturers (IACM), which regulates purity and reliability. India Tree has a wide range of color options available in its line of natural food colorings. The food colorings contain no synthetic materials and are made from very concentrated vegetable colors. Void of dyes or corn syrup, these colors are perfect for the cook who wants healthy color. Seelect's natural and USDA Certified Organic food colors are derived from various fruits and vegetables and contain many beneficial antioxidants. Raw materials used to create the high-quality food color products include cabbage, hibiscus flowers, gardenia flowers, annatto seeds, turmeric root, beets, carrots and cabbage. Using a wide range of flowers and vegetables, high in life supporting antioxidants, bioflavonoids, and polyphenols, Nature's Flavors is committed to producing high-quality, safe and effective food colorings without the use of harmful chemicals. Nature's Flavors was the first company to produce a wide range of organic flavors and colors. If you want to get creative, try making your own natural food coloring. Safe and healthy food coloring can be made with a few simple and healthy ingredients. Bring 2-cups of water to a boil. Let the water cool for 1 minute. Add a small amount of turmeric to the water. Continue adding little bits of turmeric until you reach the desired color. Store in a glass container after cooling. Add several medium-size, unpeeled beets to a pan and cover them with water. SImmer the beets for 35 minutes or until they can be pierced with a fork. Chop the beets and put them back into the pan with the water. Leave the pan for several hours, watching as the color of the water changes. Strain the liquid through a piece of cheesecloth into a glass jar. Mix 2 teaspoons of organic white vinegar into the water. Place 2-cups of fresh spinach leaves in a pot. Cover the leaves with water. Boil the leaves for 1-minute. Let the pot simmer for 10 minutes. Strain the colored water through a cheesecloth into a galss jar. Store with a tight fitting lid. Whether you choose to buy your natural food coloring from a responsible and reputable manufacturer or make your own, it is right to say that natural food coloring offers a safe and efffective way to add healthy appeal to any food.